Adding a sticky bar to your WordPress site can benefit your blog or business in a number of ways. First, what is a sticky bar? 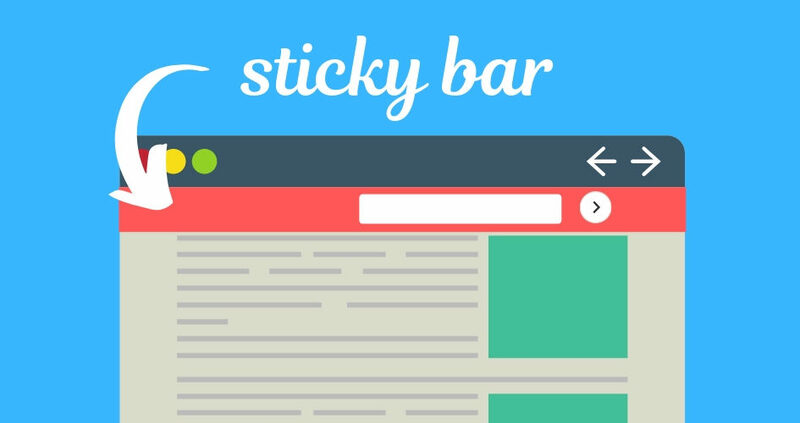 A sticky bar typically refers to a fixed navigation menu on a webpage that remains visible and “sticks” in the same spot as the user scrolls down or moves around your site. This makes navigating your website easier for your visitors. 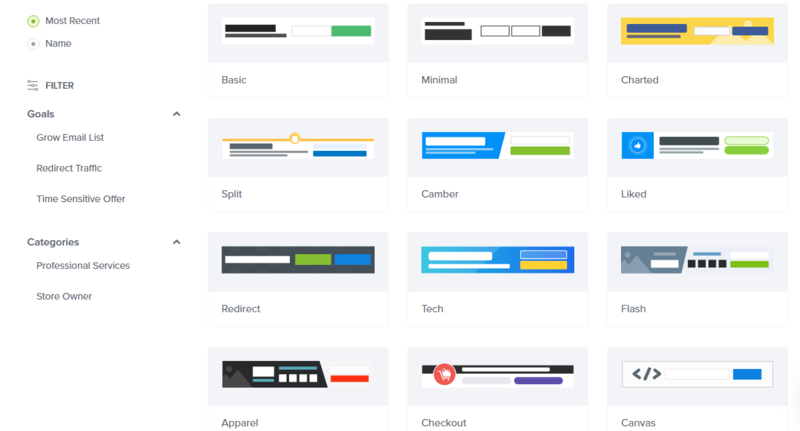 But, did you know there’s another type of sticky bar you can add to your website? That’s right, you can add a sticky promotional bar, also known as a floating bar, to your website to catch the attention of your visitors. You can use a sticky promotional bar to promote a new article, announce a sale, encourage your visitors to sign up for your email list, and more. There are a number of tools that allow you to easily add a sticky promotional bar to your WordPress site. But with so many different options, how do you know which one will work best for you? Don’t worry, we’re here to help you out. We’ll share with your some of the most popular tools and help you figure out which choice is the best. Here’s how to add a sticky promotional bar to your WordPress site. WordPress Notification Bar is a free WordPress plugin by SeedProd with over 8000 active installations. Setting up your sticky promotional bar is quick and easy with this plugin. Simply go to Settings and you can choose your own custom message for your sticky bar, enter the text for your call-to-action button in the Button Label section, and add the link for the page you want to lead users to when they click on your call-to-action button. You can also choose what color you want your sticky bar to be. Don’t forget to check the box to make the bar sticky in the Position section and make sure it’s enabled on your site by checking the box in the Enabled section. Click Save Changes and you’re done! One of the downsides with this free plugin is that you can only create 1 bar for your site. But they also offer a Pro version that includes advanced features such as unlimited bars per site, the ability to capture email leads, custom countdowns, social media icons, and more. 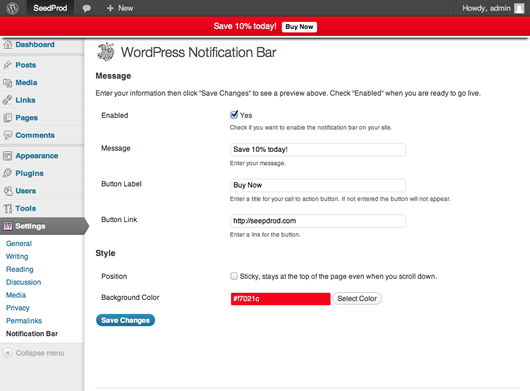 Another popular WordPress plugin for sticky promotional bars is the WPFront Notification Bar. WPFront Notification Bar has over 30,000 active installations. Even though this plugin is for a “notification bar” it works the same way as a floating bar or sticky bar to promote your email list, announce a sale, and so on. You can display a message across the top of your website and add a button that opens a URL if you want. You can also choose which pages the bar displays on, pick the colors of your bar, text, button, etc., and set a start and end date for your sticky bar as well. This simple plugin will do the trick of adding a sticky promotional bar to your website, but beginners might be overwhelmed by all of the setting options you have to deal with. Aside from the sheer number of settings you have to deal with, designing your sticky promotional bar is will be difficult for some. For instance, you have to choose the height of the bar in pixels and you won’t be able to see how it looks until you visit your website. OptinMonster is the most popular lead generation tool on the market, this tool allows you to easily convert your website visitors into subscribers and customers. They’re known for their Lightbox Popup feature but they offer the ability to create a number of other campaign types including a floating bar. With OptinMonster, you can easily design a sleek-looking floating bar for either the header or footer of your website, without touching a line of code. They offer a range of pre-designed templates that will give your sticky promotional bar an amazing look. Plus, they offer templates designed specifically for a number of occasions and industries including apparel, checkout, Black Friday, holiday, and more. With their live drag and drop editor, you can see what your floating bar will look like as you’re creating it. You also have the ability to customize your sticky promotional bar any way you like. You can add elements like buttons, countdown, images, icons, and more. In addition, you can choose from an extensive range of triggers and targeting rules that allow you to grab the attention of the exact audience you want. You can control the visibility of your floating bar with Page-Level Targeting, Geo-Location Targeting, Device-Based Targeting, Scroll Trigger, and more. With OptinMonster’s powerful features you can easily create a sticky promotional bar for your website that will dramatically increase subscribers, generate leads, and boost sales. In fact, take a look at this case study from ActiveCampaign. With OptinMonster’s floating bar campaign, they added 800 free trials every month. With OptinMonster, the customization options for your sticky promotional bar are endless. Plus, creating a floating bar that not only looks great but is powerful too, is incredibly easy. Whatever the goal you have in mind for your sticky promotional bar; whether it’s to get more email subscribers or to increase sales, you can accomplish it with OptinMonster. Don’t wait any longer, this small but mighty bar can do wonders on your website! 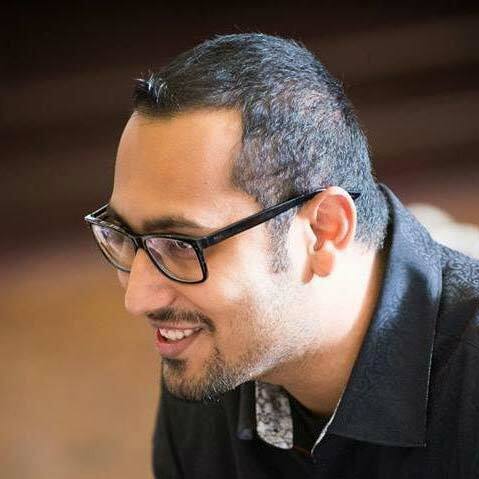 Syed Balkhi is an award-winning entrepreneur and online marketing expert. He is the co-founder of OptinMonster, WPBeginner, MonsterInsights, WPForms, and SeedProd.